The Celebration of Love Arrangement blooms with the colours of happiness and grace to celebrate your wedding day. 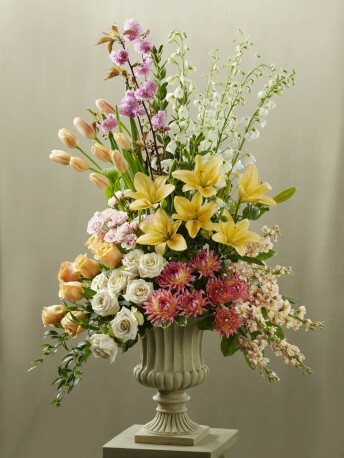 Peach tulips, peach roses, white roses, peach stocks, dark pink dahlias, white delphiniums, pink spray roses, peach asiatic lilies, pink flowering branches and an assortment of fresh, lush greens are beautifully arranged in a resin urn and displayed on a 3-inch pedestal to brighten the alter during your ceremony. Approx. 48"H x 30"W.